« Back to The PI's Perspective 1,000 Days on the Road to Pluto - Time Flies and So Does New Horizons! It’s hard to believe, but Oct. 15 will be the 1,000th day of flight for New Horizons. And in that time we’ve traveled so far that only four other spacecraft – Pioneers 10 and 11 and Voyagers 1 and 2 – have ventured farther. Can you believe it’s been this long? Sometimes it seems so, but other times, it seems like we just blasted off from Florida on that cool afternoon of Jan. 19, 2006. Of course, it’s been a busy 1,000 days for everyone involved. After an exciting launch day none of us will ever forget, we spent the first four months of flight checking out our spacecraft systems and making the initial course corrections to put us right down the middle of the pike to our Jupiter flyby aim point. In June 2006, we conducted a surprise flyby of small asteroid 2002 JF56 (which has since been named “132524 APL”) to test our ability to track moving targets. Immediately after that, we turned our attention to payload checkouts and initial calibrations, which we completed in the fall of 2006, and then we went right into planning for our Jupiter flyby. 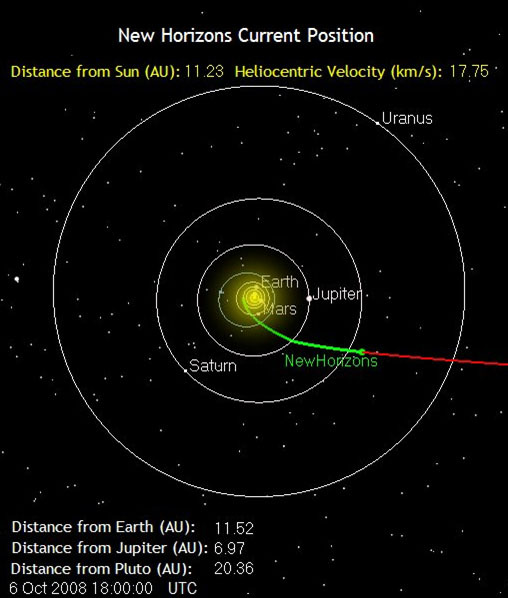 The Jupiter flyby, which culminated in closest approach on Feb. 28, 2007, was a spectacular success, and New Horizons continued in data-taking mode through the end of last year. Since then, we have been alternately hibernating and operating the spacecraft in its annual checkouts. Presently, we are nearing the halfway point of Annual Checkout 2, which began Sept. 2 and will end on Dec. 16. Following ACO-2, we will hibernate until next summer, when we wake our “sleeping beauty” to conduct the first dress rehearsal of the Pluto encounter. This fast pace of activity has made the time fly since launch, and by this time next year, more than 40 percent of our 9½-year journey will be behind us. New Horizons has been in flight for nearly 1,000 days, and is more than one-third of the way to our destination planet at 32 Astronomical Units. But that’s getting ahead of the story, because rather than concentrating on next year’s journey, which I will do in an upcoming update, I want to instead brief you on ACO-2’s progress and our near-term plans. Over the past five weeks, as our spacecraft hurtled on through the wild black yonder beyond Saturn, New Horizons received major upgrades to all three of its software systems: Command and Data Handling (called C&DH), Guidance and Control (G&C), and Autonomy, which is our fault detection and correction software “autopilot.” These upgrades were radioed up to the spacecraft to fix various minor (and two pretty major) bugs discovered since launch, add some new capabilities, protect the three codes against certain fault conditions and put us in position to conduct the Pluto system encounter. In fact, for both C&DH and G&C, encounter versions of the software are on board. We still need to add a few autonomy upgrades, but we are now executing well over 95 percent of the encounter code capabilities. Planning for these upgrades began after the Jupiter flyby. First we identified dozens of code fixes and enhancements that we wanted to make; we then modified the existing code to their new versions, which in turn was followed by months of ground-based testing of the new software packages. The process culminated with the three uploads in September, which went as smoothly as anyone could have dreamed – a testament to the care that our mission operations team put into these delicate “brain transplants.” And since the new codes were started, everything has worked as advertised – which is a testament to the hard work and talent of the New Horizons engineers who designed and tested the codes over the past year. 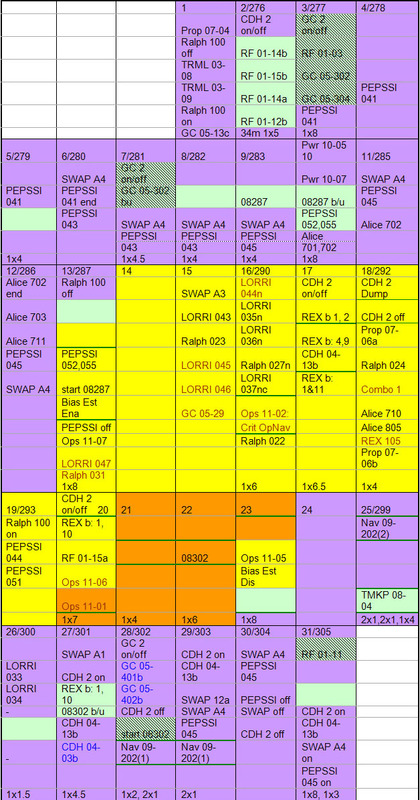 With the code upgrades behind us, we have turned our attention to a busy October of subsystem and instrument checkouts, instrument calibrations, and a four-day test of the spacecraft’s “encounter mode” – something we have not yet tested very much in flight but need to before the first encounter rehearsal next August. The rapid-fire pace for the New Horizons team won’t settle down until November, when we concentrate on several weeks of cruise science observations of the interplanetary environment between Saturn and Uranus using our PEPSSI, SWAP and Student Dust Counter instruments. We’ll stop collecting data after Thanksgiving and prepare New Horizons and its payload for another long sleep, which is set to begin Dec. 16. The sister instrument to our Alice ultraviolet spectrometer, flying on the European Space Agency’s Rosetta comet mission, performed perfectly in an encounter with the asteroid Steins on Sept. 5. In fact, in that encounter, that Alice instrument obtained the first far and extreme ultraviolet spectra of any asteroid. Go Alice team! The Great Planet Debate meeting, held at the Johns Hopkins Applied Physics Laboratory Aug. 14-16, brought together more than 100 educators and scientists to continue the debate over what is and is not a planet. As a post-meeting press release states, there is still a lot of controversy among scientists – and it seems the only point beyond contention is that there is contention between researchers on Pluto’s status and the status of other dwarf planets. So the debate continues. A full-scale model of New Horizons has been placed in the Udvar-Hazy Center of the National Air and Space Museum, and it will be dedicated later this month with speeches and toasts. Of the thousands of spacecraft launched since Sputnik, only a few dozen are represented with models or replicas in the National Air and Space Museum, and we are very proud that New Horizons is in such historic company. NASA presented our entire project team with a Group Achievement Award for the successful development and launch of New Horizons. With that also came a Public Service Medal – the highest distinction NASA can bestow on a person on a robotic space mission – for our project manager, Glen Fountain! 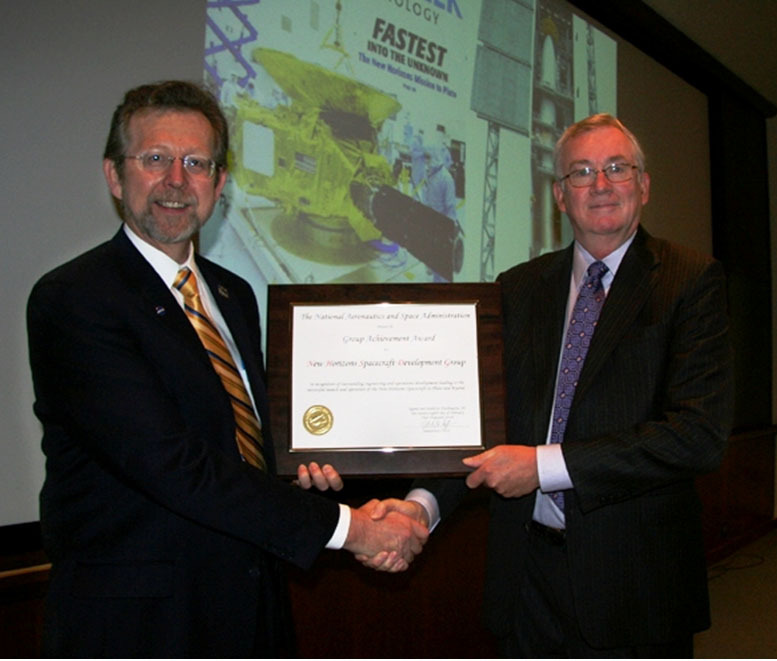 On behalf of the New Horizons development team, Project Manager Glen Fountain (right) accepts the NASA Group Achievement Award from NASA Headquarters Planetary Division Director Jim Green. Fountain also received a NASA Public Service award for his stewardship of New Horizons during its design, construction and launch. Finally, just a reminder before I close: During most weeks we post a few brief, one-sentence Web updates on New Horizons activities, or on something you may not know about the Pluto system or the Kuiper Belt. 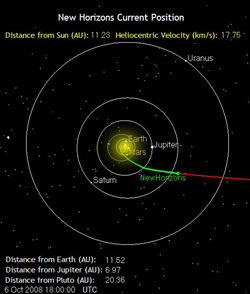 You can see these updates at any time on www.twitter.com/NewHorizons2015 – you also can sign up for your own Twitter account at www.twitter.com and check the box to follow “NewHorizons2015.” so you get updates whenever we post them. Well, that catches you up on what the spacecraft and project team have been doing, and what’s coming up in the next few weeks. I’ll be back with more news in mid- or late November. In the meantime, keep on exploring, just like we do!